Every year regular, full-time CalArts Staff have the opportunity to vote on a revised summer work schedule and in recent years the voting has shifted from paper to electronic ballots. Below are some things you might run in to when trying to register your vote! 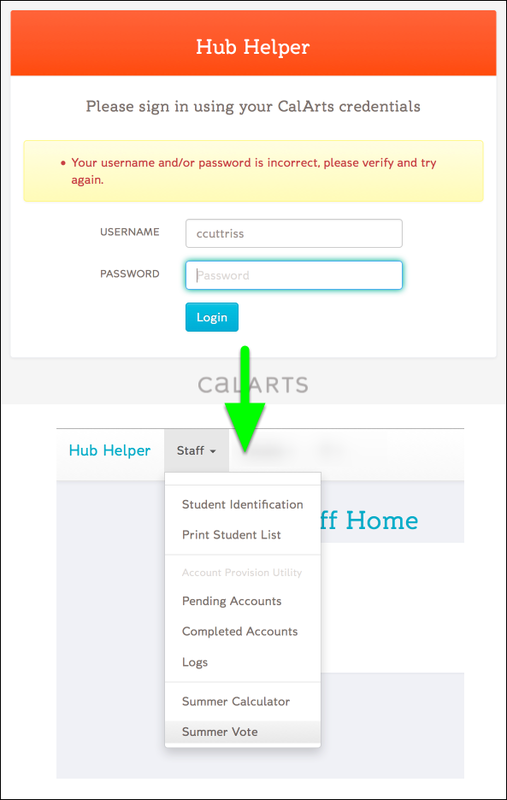 If you happen to type your password incorrectly, then login with a correct password, you'll be taken to the HubHelper main page -- not directly to the ballot. To get to the summer voting ballot click on Staff in the upper right hand corner of the HubHelper page, then click on Summer Vote. After casting your vote you should see a green confirmation box. If you see that then your vote has been counted and you can close the browser! If you see the message below when trying to cast your ballot you should call Human Resources to get it cleared up. Voting for the Alternative Summer Schedule is only open for one day, April 27th, from 8:00AM to 5:00PM PST. If you are not able to vote electronically during that window you can cast a paper ballot at Reception on the 3rd floor.